Church Gardens is ten acres nestled under the Kaitake ranges, a part of the National Park surrounding our favourite mountain, Mt Taranaki. We can see the sea and this gives us a mild sheltered climate. We’re much warmer than New Plymouth and even Oakura just two kilometres away because the ranges shelter us from the southerly winds. The original owners in the 1960’s bulldozed all the topsoil away. Despite this we enjoy phenomenal growth rates due to the high rainfall 100 inches or 2.5 metres a year and free draining subsoil. We’re almost frost free, at least we kid ourselves we are! Church Gardens is a collection of theme gardens. The lower gardens are mostly deciduous with plants from Japan and Korea, China and the Appalachians in eastern America. These four regions of the world have many plants in common because they used to be part of the same landmass 190 million years ago. 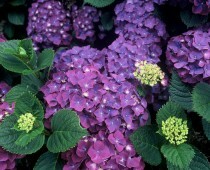 Link plants such as Hydrangeas, Magnolias and Clethra grow in all these countries. We’ve made a real effort to encourage birds into the garden and now we have native Pigeons, Tui’s, Bellbirds, Grey Warbler, Kingfishers and Grey Ducks nesting in the garden. Our favourite exotic birds like Goldfinch, Greenfinch, Chaffinch, Blackbirds and Thrushes, and even Roman Pheasants also seem to like us too and make their home here. Magpies, Hawks and Eastern Rosella Parrots cruise through every day but don’t cause any problems as smaller birds have plenty of cover. We have three cats but thankfully they are too well fed or too lazy to bother the birdlife. We now have the best collection of Hydrangeas in New Zealand including cultivars and also wild species. Even with this vast collection of Hydrangeas we have not let them dominate the garden. The garden is a mix of interesting plants, fascinating for the real enthusiast but we hope we have landscaped it in such a way as to be a pleasant garden walk for all visitors. Much of the design work in the garden and all of the rock placement was done by our good friend David Anyon. I learnt more from David in one weekend than I did from years of study. The upper parts of the garden are more typical Kiwi with a large pond, Azaleas, Camellias Rhodo’s inc’ a good collection of Vireya’s. With our very mild climate there is something to see every day of the year. Mid winter (June/July) we have Vireya Rhododendrons and Camellias in full flower, August thro to November is spring with Magnolias, Rhodo’s Azaleas etc, then summer brings the glorious Hydrangeas into play followed by the autumn colours in April, May and even June when the Taiwan Maples colour up. The garden is open every day during the Powerco Taranaki Garden Spectacular in late October and early November. Other times the garden is open by appointment. Ideally ring between 5 and 6pm when I’m guaranteed to be in the house. Entrance charge is $8.